Welcome to 2019 — even though one month of it has almost gone. We have certainly had some beautiful weather and also some much-needed rain. I do hope it has been sufficient for the gardeners and the farmers. It is a reminder to us all that yes, our climate is changing and our responsibility is for each and every one of us to do what we can to reduce the impact of this as best we can. January tends to be a dangerous time for those around me or who have to work with me as I have more time to sit, reflect and dream of what potentially could be achievable. Yes, this morning I was sitting on the beach at Orewa browsing through a new resource I had purchased on ideas for Lent and Easter. It is good that Lent begins a little later this year, with Ash Wednesday falling on March 6. It does give a little more time for us to reflect on Christ’s life on earth before looking towards the preparation for his death and glorious resurrection.  I am hoping that over the next few weeks you will all give some thought and consideration to the vision and purpose we have in being the Anglican Church in Pukekohe, what this means to us as individuals, as a faith community, to the community in which we live and to our diocese, our country and our world. As we consider this I would like to encourage you to make notes so you don’t lose these thoughts and then to consider what we might do to make these visions become a reality as we seek to make God’s plan known more widely in our community, especially to those who are in need in any way. The last Messenger came out before Christmas and I would like to thank all those who contributed in any way to supporting our programmes. A real highlight for me was the number of children at the 5pm service, with several of them being from the play group. The playgroup breakup was also well attended and we shared the Christmas story with the children being shepherds with tea-towel head gear or angel wings as Mary and Joseph took centre stage at the manger. The many meals we shared, with our Selwyn friends and older parishioners, and those who had lost loved ones during the year, visiting choir and orchestra participants as well as children’s parties, to the many services, with five services being between our children’s service at 5pm on Christmas Eve and the 9.30am on Christmas Day as well as services and singing at the rest homes. This requires a huge commitment from many people including our musicians. In the New Year there has been a lot of time cleaning out the rooms and sorting resources. Again thanks to those who have helped. The Seasons team had about 12 people in helping over two days and that made a great difference. These volunteers, along with the wonderful team of Op Shop volunteers who work tirelessly throughout the year, make such a tremendous difference to how people in the community perceive the church and the love of God. There are still some areas needing attention and I will be asking for help with these over the coming months. Wishing you all a spirit-filled 2019 as we continue to seek to be the people God calls us to be. Anyone who has a child aged 6 and over who would like to learn more about Communion please let Jan know, along with the preferred day of the week for meeting. If you feel you would like to be confirmed this year or would like to find out more about this please talk to Jan. I have included below the following message, as requested by the sender. The pamper hamper referred to was actually one provided by TrailLite Motor homes. Katy Newman from TrailLite is one of our Seasons companions. I delivered this just before Christmas. Judy and John Bennett hosted a morning tea for the family to meet some other people from South Africa. A very special letter from one of our Space Programme mums that she asked to be put in the Church Newsletter. Greig and I would like to thank you from the bottom of our hearts for the love and kindness you have shown us. We are going through one of the biggest challenges in our lives. When I was diagnosed with breast cancer we were scared, devastated and felt very alone with all of our family living in South Africa. I can say with confidence that we are definitely not feeling that way any more, thanks to all the support we have received so far. We will get through this because God has given us human angels, like you, carrying us during this difficult time. The love and generosity we felt as we unpacked the hamper was quite overwhelming and we will not forget the sincere opening of your hearts to us. Seasons is an innovative grief and loss programme that uses the imagery of the year’s seasons to illustrate the experience of grief. It aims to strengthen the social and emotion well-being of the person who is dealing with significant life changes. They do this by exploring the impact of change and loss on everyday life, and learning new ways to respond to these changes. Trained adults facilitate the small group programme, where participants support and learn from each other in age appropriate and engaging activities. The training is for two days. Would you or a person you know be interested in attending one of our grief and loss programmes as a parent to support your children or as an adult for help with your own grief? Are there children you believe would benefit from attending such a programme? New programmes will be starting shortly in all areas. Or maybe you would be interested in training to be a companion? In order to grow our programmes and make them accessible to more people we need more trained companions. Last year we had more than 150 people attend the programmes. I am very grateful to everyone who assists with the Op Shop in any way. This includes our managers, Judith and Alistair Parke, the many sorters and shop attendants, as well as those who help with the lifting, shelving and keeping order in the storeroom. We have, over time, had people retire or leave for ill health reasons, so the Op Shop continues to need further assistance. If you have some time that you could offer to this very special ministry, please talk to Judith, Alistair or Jan. Many of our helpers actually really appreciate the opportunity for a morning out and having someone to talk to. Without the Op Shop there are many ministries we would not be able to continue. Funds provide the perishable food for food parcels, some of our emergency meals, and tremendous support to our Pukekohe Community Action programmes as well as Anglican Trust for Women and Children and the Auckland City Mission. They also provide items for people referred from Victim Support, Franklin Family Support and Women’s Refuge to name a few. If you know a new mum with her first child she may benefit from a group where there are trained facilitators who provide teaching on an aspect of parenting or child development each week. There is also time for sharing their experiences with each other which can be hugely helpful and a time for socialising for both parents and their babies. Please keep an eye out for mums with new babies in your neighbourhood who may have just moved into the area and may be quite lonely. Please talk to Jan if you would like to be put in contact with our Space co-ordinator. Accomplished English organist Jane van Tilbourg performs at St Andrew’s this Saturday. Entry by donation. The hour-long recital includes works by Dieterich Buxtehude, Johann Sebastian Bach and Louis Vierne. 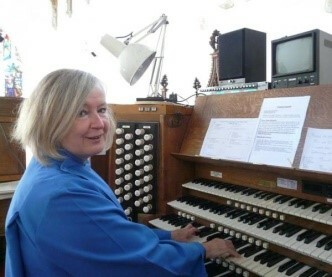 Jane was organist at Nelson Cathedral before returning to live in England in 2015. Light refreshments in the Nora Brown Hall will follow the recital. $5 per Adult / $15 Family. Please bring a salad or dessert to share. Numbers attending essential so please put your name on the sheet in the foyer. This is an open group with the purpose of getting to know each other better and offering support and encouragement to each other. You are welcome to stay for a shared lunch if you wish. Pauline Taylor — Goodbye, Best Wishes and Thank You! 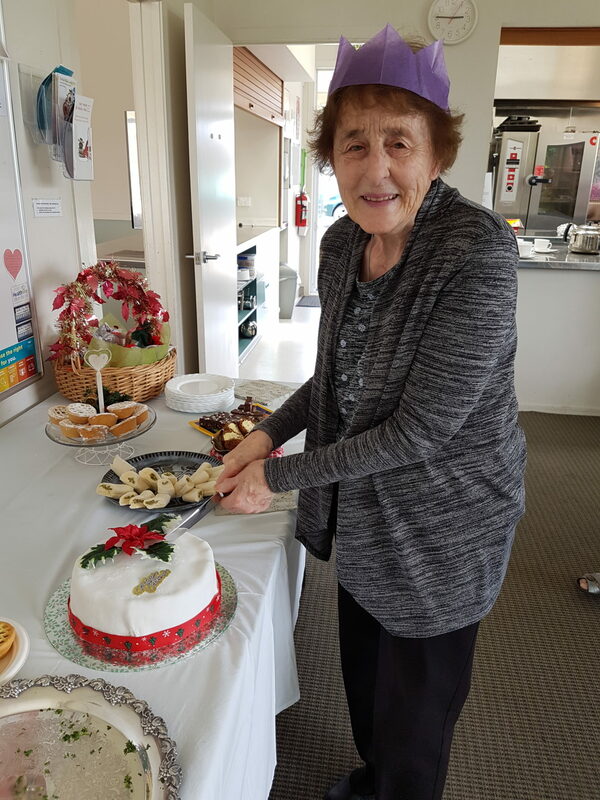 At the end of 2018 we farewelled Pauline Taylor as she moved south to be nearer to her family who are based in Dannevirke. Pauline has settled happily into the Eileen Mary Rest Home. She is finding her new home cosy and friendly having known so many of the residents for years. She has asked me to tell you she is missing her St Andrew’s friends. She keeps us all in her prayers and wishes us a great 2019. I sent Pauline a poinsettia plant at Christmas with love from us all. Pauline has left some ministry gaps in the parish and I am very keen to hear from anyone who may be interested in finding out more about these. Prayer Chain Co-ordinator: One is being our co-ordinator of our prayer chain. Prayer is a very important part of the life of the parish. It is important that we keep people in our parish and in our community in prayer. I would like to see this role filled as soon as is possible. In the meantime, please leave any prayer requests directly with me or provide Noeline in the parish office with the name of the person in extra need of our prayers. Parish Mission Co-ordinator: We would like a person to check the mission information received by the parish and draw items to our attention and write short items for our Messenger. The parish is committed to contributing to the work of the Anglican Board of Missions. We do this by a direct credit each month. This means the board of missions is in a position to act immediately when crisis events arise as well as supporting many of the well-established mission projects. with her family and in her new residence. A huge thank you to everyone involved. It is amazing how young people though initially strangers, can come together and be friends within minutes. At the time of writing the programme still has two days to run but it looks as if we have at least 22 children being involved altogether, with about 16 being there on any one day. It seems spring has sprung anew in the St Andrew’s Communal Food Garden! Growth is prolific due to all the wonderful rain we have had and a new feature has been added to bring some fun to the garden. Actually, three new features. One is Ostig (Outstanding in the garden), pondering the second, a new raised garden bed. The third is to be a water pump feature, one that will have the practical function of watering the garden from the connected rain water harvesting system. A water trough is now installed and to complete the picture, we would like to install a cast iron hand water pump. Can anyone help with this, either by a donation of the hand pump, or cash so that we can purchase one (the cast iron pump pictured costs around $250)? A later stage of this development will be to install a solar-powered pump and water hose reticulation. Our Friends of the St Andrew’s Food Garden meet at 7.15pm every Wednesday evening during daylight savings time, to maintain the food garden.